In order to build a retirement portfolio that is capable of covering expenses in your golden years, it?s necessary to start saving while you?re young. Many individuals realize the importance of investing early in life, but simply don?t know where to begin. There?s no time like the present to start investing. So, get started today! 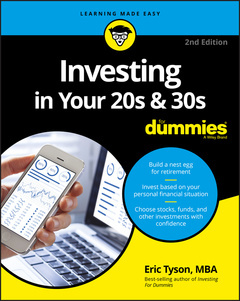 For the 20/30–something novice investor seeking sound guidance and trusted investment strategies to help them take control of their investment options. Eric Tyson, MBA, is an internationally acclaimed and best–selling personal finance author, counselor, and writer. He is the author of five national best–selling financial books, including Investing For Dummies, Personal Finance For Dummies, and Home Buying Kit For Dummies. He has appeared on NBC′s Today Show, ABC, CNBC, FOX News, PBS, and CNN.